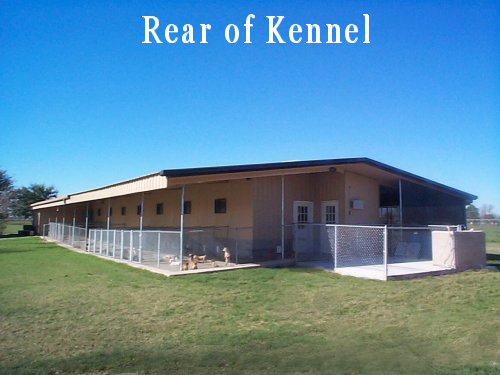 Here is the backside of Velvet Touch Kennel. The area right in the back with the fence around it is not another doggie run. It is a new addition to the kennel. Here is where we do a lot of our cleaning of dog beds and food bowls. The concrete square on the right has a bathtub in it that we use to clean and sanitize the food bowls and dog beds. The door on the right is our quarantine room. It has its own heat and air in it. It has several concrete floors which can be hosed off and disinfected. Here is where we keep any new Teacup Poodle or Tiny Yorkie Puppy we get or if Poodle or Yorkie becomes ill we will keep it there until it becomes better.